The low glycemic index diet can be a very effective option for those who want to keep their blood sugar levels under control, especially those that are at risk of developing diabetes. The foods low on the glycemic index are the ones that are best for your health if you have problems with high blood sugar, and you’ll find that foods high on the glycemic index and obesity tend to go hand in hand. 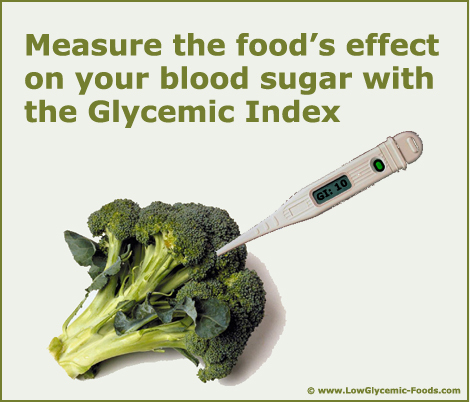 The lower the glycemic index of a food, the better it will be for your blood sugar levels. So in that respect it’s all quite simple. The lower the index, the better the food! However, in order to fully understand how the glycemic index works in practice (there are important nuances, you see) it is a good idea to take your time studying the mechanisms of the system … and don’t worry, there is a logic to it all. The glycemic index is a ranking system that helps to identify the type of carbohydrates in a food, in order to determine how much of an effect the foods will have on your blood sugar levels. Carbohydrate foods that are high in sugar are higher on the glycemic index, while foods that are lower in sugar have a lower ranking on the index. However, again, the ranking is actually about how much the food affects your blood sugar. The more of an effect a food has on your blood glucose levels, the higher its ranking will be. The interesting thing is that it’s not just the high sugar foods that are on the list. It’s also the foods that are rich in starch, as any starches in food will be turned into glucose by the body. You have foods like apples and berries that have a lot of natural sugars, but they are lower on the list thanks to the fact that they’re rich in fiber and other nutrients. You have foods like bread and potatoes that aren’t too loaded with sugar, but they’re higher on the list due to their low fiber and nutrient content. The purpose of the glycemic index is to help people to understand how the food you eat has an effect on your blood sugar. Just like those with heart problems have to avoid the foods rich in fat and salt, so too the people with diabetes will need to avoid the foods that are rich in fast carbs. These simple carbs will cause your blood sugar levels to get way out of control, which can cause your body to produce too much insulin, which again pushes your blood sugar levels too far down which will make you feel uncomfortable. Processing, the more it’s processed, the higher the GI – It’s interesting to note that processed juice has a higher GI than the ‘real’ fruits, and white bread has a much greater effect than whole wheat bread. The reason for this is that the processing of foods can often cause the breakdown of the nutrients, which makes it easier for your body to absorb the food and turn it into sugar more quickly. 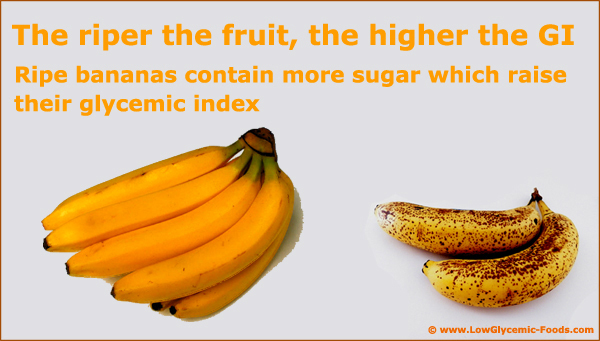 So in short, the more processed the food is, the higher on the Glycemic Index it is likely to be. Ripeness – the riper the food, the higher the GI – A ripe fruit has more sugar in it than an unripe fruit, so it will be higher on the GI. The ripe fruits are easier for your body to process, and there will often be less fiber in the ripe fruits. 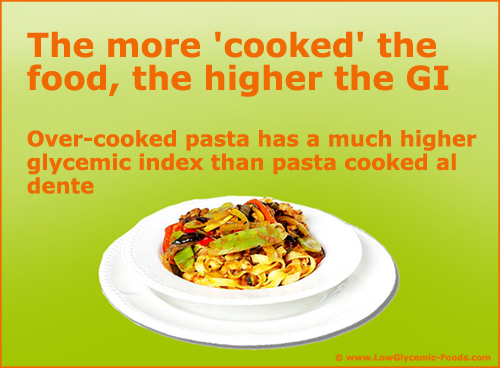 Cooking – the more ‘cooked’ the food, the higher the GI– Did you know that cooking can actually increase the GI of certain foods? For example, cooking pasta past the al dente stage will increase the effect it has on your blood sugar, as overcooking it makes it easier for your body to break it down. The way you cook your foods is very important, as you can increase the glycemic index ranking of your meals if you cook your food incorrectly. The glycemic index value of a food will tell you how much of an effect the food has on your body, but it doesn’t tell you how much you need to eat. You need to get a checkup in order to determine just how much carbs are good for you every day, and use the GI to help you to count the carbs you eat. The GI just tells you about the effect of the carbs in the food, not how many your body needs. Foods that are nutritious will often be ranked higher on the glycemic index than foods with very little nourishment, but that doesn’t mean that it’s better to eat the low-nutrient foods. You need to use the GI to help you determine how you can cut the carbs in your diet, but you also need to use your judgment to have a healthy low glycemic index diet with balanced nutrients. If you just eat low carb foods, you could end up with a range of other health problems. Eating the foods on the GI will affect your body, but combining foods will change the way each of the foods affect you. Perhaps adding more fiber to a bowl of carb-rich food will help to reduce the glycemic load on your body, or juicing an apple will make it affect your body more quickly. 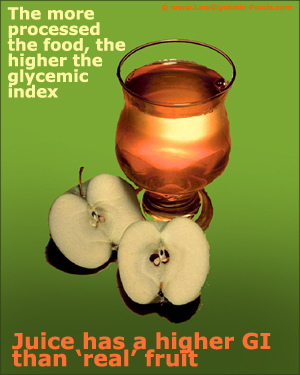 Remember that combining or altering foods will alter their glycemic effect on your body. E.g. if you eat a very ripe banana which will score high on the glycemic index, it might be a good idea to supplement with some healthy protein and fat from nuts or pumpkin seeds. If you’re trying to keep your blood sugar under control, it’s important that you follow the glycemic index table carefully. You want to avoid problems with your glycemic control, and you can do so by reducing the amount of carbs that you eat. A low glycemic impact diet will help you to keep your blood sugar under tight rein, and it will ensure that your blood sugar doesn’t get too high. This will be the best way to prevent diabetes. However, keep in mind that there isn’t a diet that will be perfect for everyone. Every person’s body is unique, and it handles sugar, fats, and other nutrients differently. The goal of following a healthy low glycemic index weight loss diet is to help you keep your blood sugar under control, but you don’t want other problems to crop up to take their place. If you eat too much protein just to keep your carb consumption low, you may find that you develop heart problems instead of diabetes. If you eat a lot of saturated fats, you may end up with high cholesterol levels. Take steps to keep your cholesterol and fat consumption low, as that will ensure that you don’t gain weight or develop heart problems. Make sure to avoid too much sodium in your diet, as that will contribute to high blood pressure. By following a healthy, balanced low glycemic index diet that includes all of the various nutrients that your body needs, you’ll help prevent sicknesses and disorders from being a problem in your future. Counting Carbs Is Tedious but Is a Good Way to Get a Feel for the Food in the Beginning? 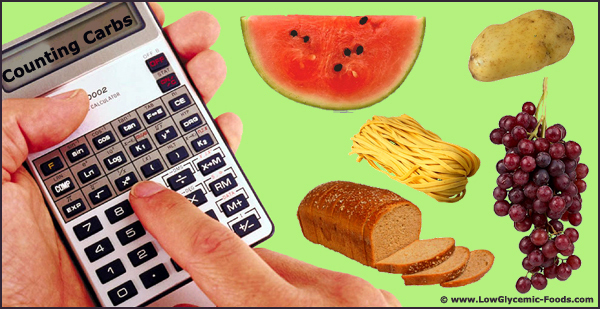 Many people hate counting carbs and calories, as it’s a time-consuming, frustrating activity. It can be very limiting for you to count carbs, and you may find yourself annoyed by always having to check the glycemic index just to be sure that you’re getting the right amount of carbs. If you’re doing it, you may find that you want nothing more than to eat with abandon instead of counting every carb in the food you eat. However, the truth is that counting carbs can be a very good idea, and it’s highly recommended if you have problems with your blood sugar levels. Just like counting calories is good for weight loss, so too counting carbs will ensure that you keep your blood sugar under control. It will be the only way that you can be sure that you’re eating the right foods, as well as avoid eating the wrong foods. Even if it’s a lot more work than you would like, it’s still worth it to keep your blood sugar levels under control. Diabetes is one of the most common disorders in the United States today, but counting carbs can help you to avoid it. The good news is that you don’t have to count carbs for the rest of your life. If you spend a few months counting carbs and watching what you eat, you’ll find that the blood sugar problems will usually go away on their own. It’s only when you eat too many fast carbs that you start to have high blood sugar levels, but lowering your blood sugar levels will have an almost instant effect. Keeping your blood sugar under control will reduce your risk of diabetes, and losing weight will help to reduce your risk even further. Within a few months of consistently keeping your blood sugar levels low, you’ll find that you can watch what you eat without having to count every carb. Breakfast is the most important meal of the day, and adding some grains to your meal will help you to keep your stomach full and your body energized all day long. All-Bran cereal is rich in fiber, which will reduce its glycemic load on your body. Oat bran is acceptable provided you don’t eat too much of it. Rolled oats are also fairly low in carbs. Natural muesli will be a good breakfast to eat as well. Linseed and Soya bread will be much lower in carbs and have a lower glycemic effect on your body. Dark heavy mixed whole grain breads will be rich in fiber – thus canceling out the carbs. Green peas and raw carrots will be ideal for your low carb diet. You can try mushrooms, cabbage, and onions to make a delicious soup. Or you can chop bell peppers, onions, and tomatoes to make wonderful protein-rich meals. These low carb veggies are ideal for your low glycemic index diet. Cherries are surprisingly low on the glycemic index despite being richer in sugar, and you’ll find that they’re an excellent option if you want to have a delicious sweet snack. Plums and grapefruit are also excellent for a fruity treat, and you will find that prunes are ideal if you want to keep your carb consumption low. Legumes are very rich in fiber, which means that they’ll usually be a good addition to a low glycemic index diet. But navy beans and yellow split peas also make a good addition. These beans are excellent for your health, and they’ll give your body lots of protein. Dairy products contain lactose, which is a form of sugar. Whole milk is fairly low in carbs, and artificially sweetened yoghurt will be just as good. However, avoid ice cream and chocolate milk, as they tend to be higher in carbs. Watching what you eat is an important part of being healthy, and it’s in your best interests to keep your fast carb consumption under control. You might need to count carbs if you’re trying to keep your blood sugar levels healthy, and it will be important to familiarize yourself with the glycemic index as you start your low glycemic index diet. It will ensure that you stay healthy, and that you don’t develop problems like diabetes.